I created a few scrapbook textures yesterday. You can also use them for other things, like a website. But the main purpose I made them is for people to print their own scrapbook paper. The textures are all in jpg format. There are 8 textures in bright, happy colors. And the sizes are 256x256. 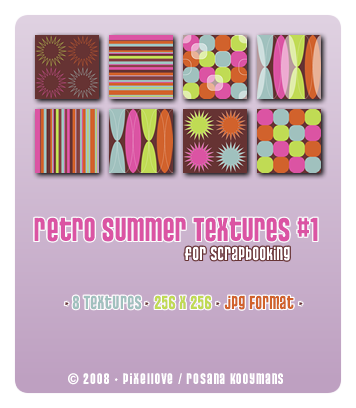 If you want me to make and release another set with 128x128 textures, let me know. I can do that as well in a few seconds. Please do not use them for anything other than personal things, like scrapbooking. If you decide to use them on a website, please at least credit me for it.